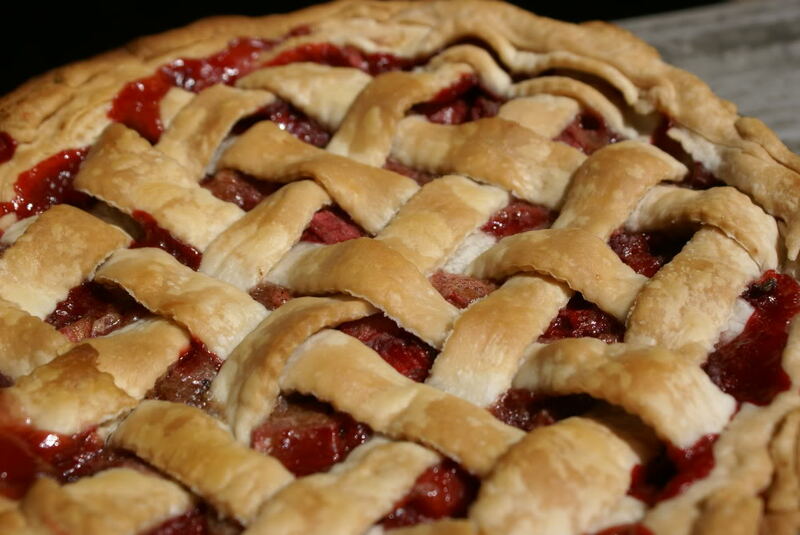 So I actually made this pie last week, before our weekend berry picking adventure. For this, I cheated and used 2 pre-made pie crusts that I’ve had in the freezer since the holidays. And I say cheated, because I much prefer to use my own…but in a moment of weakness busyness over the holidays, I grabbed a few packages and didn’t end up using them. So now I figured, I better not let them go to waste and just use them up. And enjoy the convenience! It all baked down to ooey-gooey sweet-tart perfection! 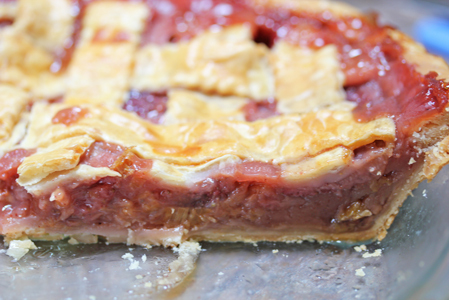 Don’t worry if your pie seems kinda “tall” when you put it in the oven…it will shrink down as it bakes! And also, I recommend baking this with the pie plate on a foil lined cookie sheet. It can make for a bubbly mess in the bottom of your oven if you don’t! Preheat the oven to 350, and lightly grease a pie plate with cooking spray. Make the crust/roll out the crust on a lightly floured surface. Place into the pie plate. 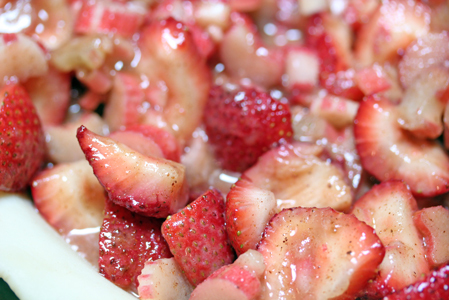 In a mixing bowl, toss the strawberries, rhubarb, sugar, cornstarch, cinnamon, nutmeg and salt. Pour the mixture into the pie plate. 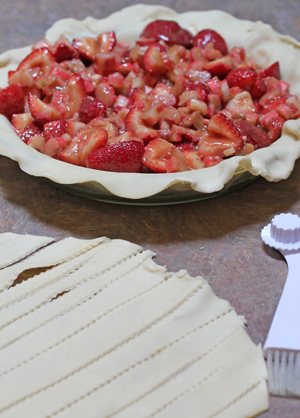 Make a lattice top over the strawberry mixture and pinch the edges together well. Mix the egg yolk with 1 Tbsp water in a small mixing bowl and brush on top of the lattice and edges of the pie crust. Bake in the preheated oven (on a foiled lined baking sheet) for 1 hour, 15 minutes. Wow it looks delicious! Is it necessary to put an ice cream?Maybe it’s hard for me to prepare like this one because it takes too much time .